Capturing new subscribers is one of the most efficient ways to convert random visitors into loyal readers that you can nurture over time and eventually turn into actionable sales leads. 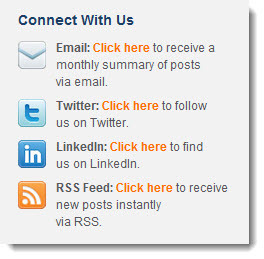 Just be sure to offer the reader as many subscription options as possible, and at a minimum: Email, RSS, and Twitter. If you post blog content to your Facebook or LinkedIn or Google Plus page, add those also. If the content on your blog is topical and relevant and insightful, and if you’re following basic SEO principles in your post title and body copy, there’s a high likelihood you’ll be generating significant traffic from interested prospects actively researching the types of issues and problems your company solves. Now the challenge is to convert those casual visitors into inquiries and opportunities. or even better, show a cover image or icon. Our experience indicates that a visual element serves to highlight the offer on the page, as well as making the asset more “real” and tangible. As with driving subscriptions (#1, above), it takes more than a row of sharing icons (Like, Tweet, +1) on your blog to get people to spread the word. My personal view is that the icons have become so commonplace that many readers don’t even notice them. You can encourage people to share your blog with their friends and followers, a proven technique for improving traffic, subscribers, and sales leads, by including both a sub-head as well as action-oriented text above the icons. This entry was posted in B2B Marketing, blog marketing, Blogs, Campaign Measurement, Campaign Strategy, SEO, Social Media and tagged b2b demand generation, b2b lead generation, b2b marketing agency, blog design, marketo landing pages, social media design, social media marketing on March 29, 2012 by Howard Sewell. This is no doubt the best 3 pointer I have seen on corporate blogging. But I believe that the point of downloadable material should have been on the top. This is the most important feature as it gives sense of ownership to the readers. I am giving this opinion from a Social Media Expert point of view.